HOVE, England (CNS) — “The Moth has landed,” tweeted the Diocese of Arundel and Brighton. 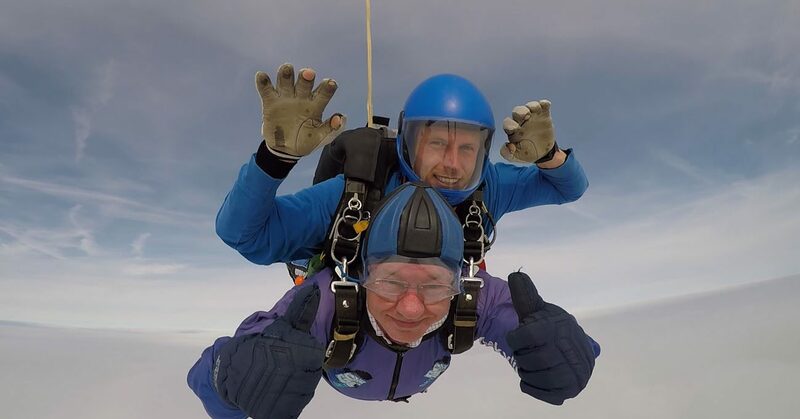 The tweet Sept. 14 and a similar post on the diocesan Facebook page was meant to assure people that 60-year-old Bishop Richard Moth of Arundel and Brighton had fulfilled his pledge to go skydiving and had completed the task successfully and unharmed. Joined by Lucy Barnes, a local Catholic school teacher, Bishop Moth jumped from a plane at 15,000 feet to raise money to take ailing pilgrims to Lourdes. “He flies through the air with the greatest of ease,” said another tweet, referring to Bishop Moth. The Bishops’ Conference of England and Wales tweeted: “Is it a bird? Is it a plane? … Wait, it’s a bishop!” They made no reference to the insect that flies and shares the bishop’s name. With a goal of 3,000 pounds (just under $4,000), the bishop raised more than 5,160 pounds on an online crowdfunding website. In a press release from the diocese, Bishop Moth said: “It requires you to trust in the person you are in tandem with and in the equipment. The staff, however, are very professional and looked after us really well.” Both the bishop and Barnes jumped in tandem with — and harnessed to — an instructor. While Bishop Moth spent six years as the “bishops of the forces,” or military ordinary of Great Britain, it was not until he was far away from the professional paratroopers that he decided to wing it in an attempt to raise enough money to send two assisted pilgrims to Lourdes.